Do you know the value of every grain of rice? Ever grain of rice is blood, sweat and tears of paddy farmers. We should be grateful to paddy farmers for providing us food. During my visit to Sekinchan, incidentally the paddy farmers in Sekinchan began the transplant of rice seedlings. It's truly strange that this work still done by workers. I found out the actual story after the explanation of the boss of the rice mill. 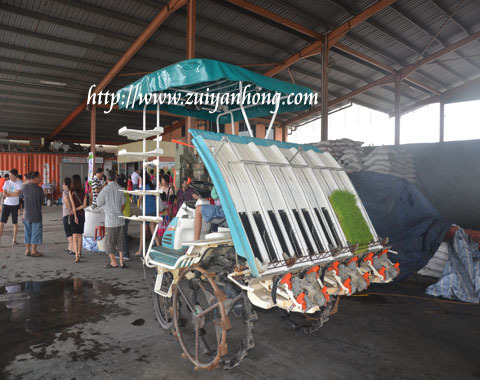 Nowadays, the transplant of rice seedlings has been mechanized. Those rice seedlings which are unhealthy have to be replaced manually. This was the rice transplant machine which was displayed at the rice mill. I missed the opportunity of seeing the workers transplanting rice seedlings. If not I would shoot a few photo to share with you. You have to travel around to widen your vision. Or else you will be a well frog.